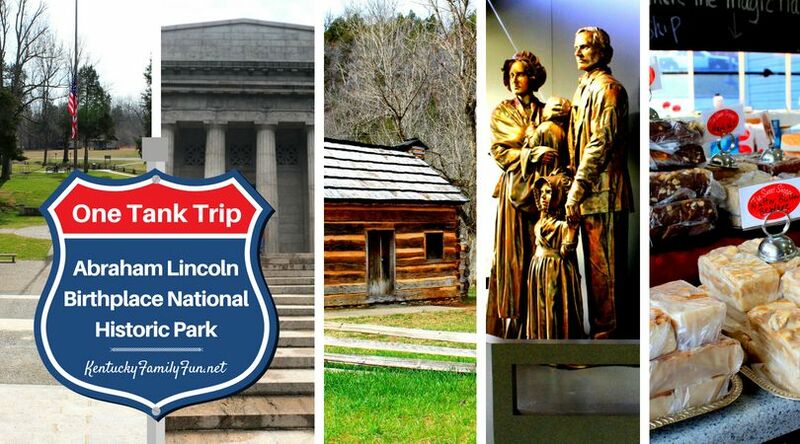 My third grader was learning about Presidents and my first grader about the Civil War so when searching for a day trip option that would be fun, a trip to Abraham Lincoln Birthplace National Historic Park was perfect. We had glorious late winter weather which made it just lovely. The park is in Hodgenville, KY so a trip to explore has to be combined with some local spots. Abraham Lincoln Birthplace National Historic Park opens daily at 8am so we headed out early. We arrived at around 10am and went to the visitor's center first. We were greeted by a friendly park ranger who told us about the Junior Ranger program. My kids loved it! They received a really well-done booklet to take around that park and do as they explore and learn. The activities were age appropriate for elementary-school-age children and engaging. The ranger told them that if they worked on it while they explored, they can show him later and he would swear them in as official junior rangers! We browsed through the exhibits at the center and watched the ~10 minute movie about Abraham Lincoln as the area we were about to see. Everything was very well done. At the top of the hill, there is a device that recites some of Lincoln's speeches and just beyond the well, there is a short (under a mile) walking path. We peaked inside of the other log cabins on the property and returned to the visitor's center so the kids could be sworn in - which was really cute. They had a lovely gift shop and the kids picked up a souvenir. The bathrooms were very clean and convenient in the visitor's center. Across the main street leading into this area, there is another picnic area and set of hiking trails. We did not visit that area but it was very close. After just a 10 minute drive following signs, we found the heart of Hodgenville. It is a quaint town circle with just enough to walk around and have a great local lunch and dessert. We walked around for a bit and read the historical markers. The center was a tribute to Lincoln with a boyhood statue, a Presidential statue and notable speeches engraved in the pavement. In the town, there were gift shops and a bookstore as well as a museum about Lincoln with a gift shop. We didn't tour the museum because we were getting hungry but we did learn about Lincoln Days (early October) and I think we'll look at going back to experience it! We saved room for dessert and went to The Sweet Shoppe. Seriously....I have never seen so much fudge. Truly. And, they make it all there and it was really reasonably priced. 3 huge pieces for $15. We got the Oreo, chocolate and a peanut butter/chocolate combo. I really couldn't decide! And, it was perfect - so so very good. They also had baked goods, candy and a variety of ice cream options. My father got a shake and I lost count on how many scoops of ice cream they put in! We drove about another 15 minutes to find Abraham Lincoln's Boyhood Home park. The park main building is only open April through October so we only explored outside - which was fine. Also, they have really clean, updated bathroom facilities. We walked around the log cabin, and went down by Knob Creek where it is said Lincoln almost lost his life as a young boy. The kids explore, looked at rocks and imagined life 150 years ago right there and what it would have been like. We stayed there for about an hour before heading back home for the day. If you are prepared for it, they do have some serious hiking trails at this location. Also, prepare to check for ticks and dress/spray to prevent taking one home! Shower when you get home! Like being out in any forest, you can come home with any number of rashes/bugs like we did. Nothing that truly caused issued but definitely something we will prepare better to prevent next time!